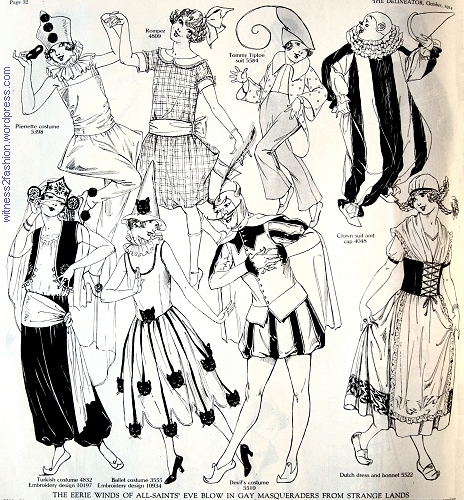 Butterick costume patterns, October, 1924. Delineator, p. 32. 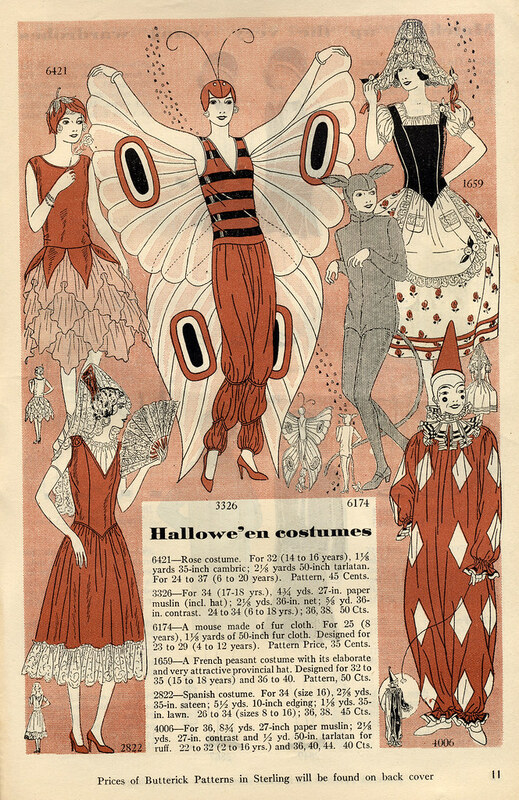 In the 1920’s, people loved masquerade parties, and they didn’t wait for October to play dress-up. 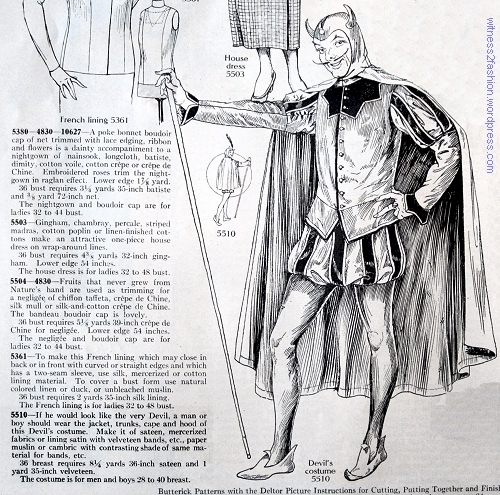 However, as Halloween approached, Butterick’s Delineator magazine showed whole pages of costume patterns for adults and children. Then, as now, some people dressed to look glamorous, or to express their inner child or alter ego. 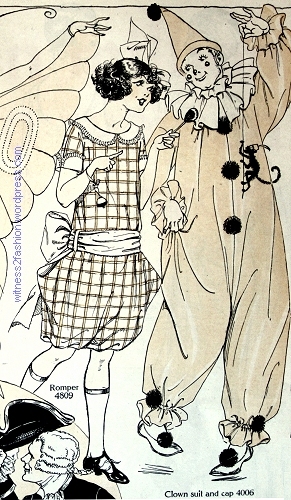 Clown costumes were popular, as were costumes with an international flavor: Spanish, Dutch, Turkish and Japanese are shown here. So is a little girl in a “Ballet Costume” — still a popular choice for little girls after 90 years. 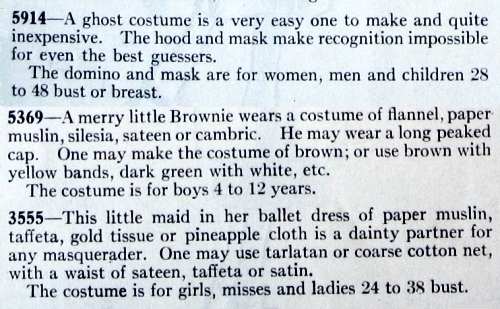 And, specifically for Halloween, “fantastic creatures” like brownies and witches appear. 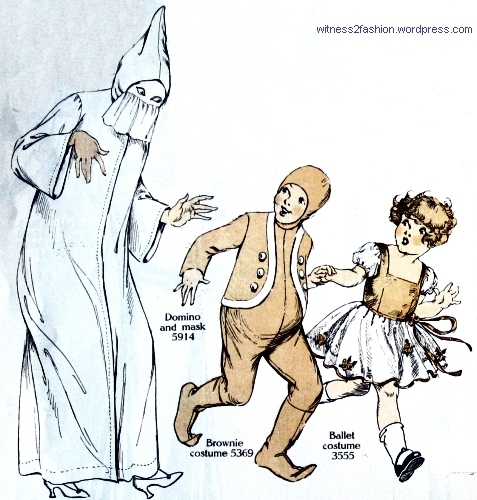 The all-white costume at far left is described as a ghost, but called a “domino,” a completely inaccurate reference to the masks and capes worn in Venice in the 18th century. 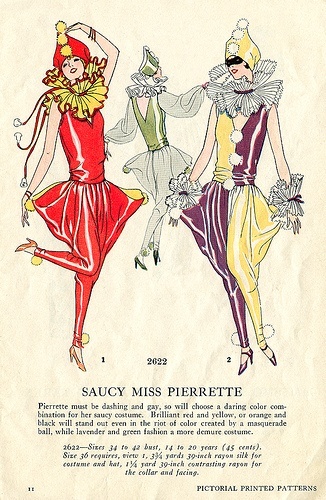 Pierette costume for ladies, misses and girls, August 1924. Butterick 5398. This is a slightly different illustration from the one at the top of this post. 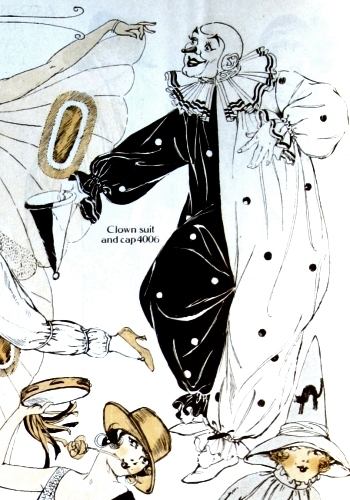 Pierrot and Pierette — usually dressed all in black and white — were popular in fiction and art. 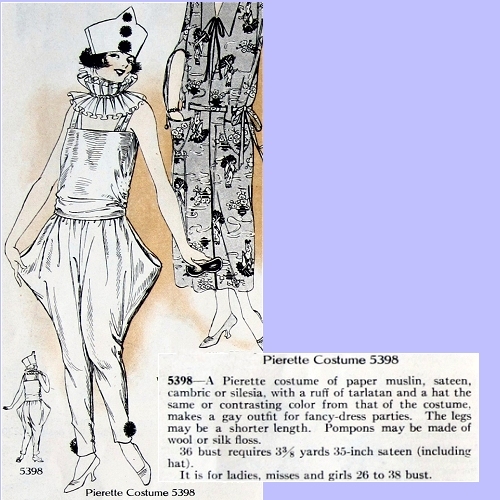 Pictorial Patterns offered a Pierette costume with wide-hipped pants, like this one. Click here to see it. So did other pattern companies. Click here. It reminds me of 1917 skirt styles. Butterick patterns for “Romper” (No. 4809) and a clown (no. 4006.) 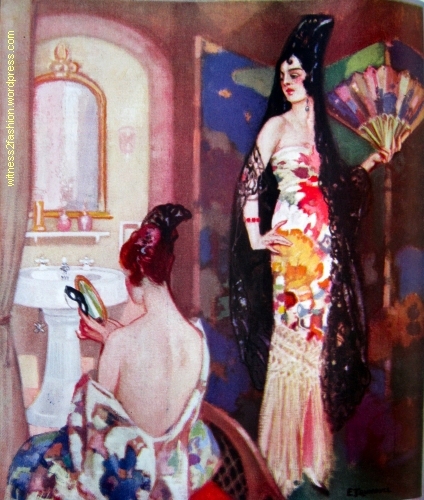 February 1924, Delineator. Dressing like a little girl was easy (and showed your knees.) Comedienne and singer Fanny Brice played a “little girl” character in the 1930’s, and, in a later period, Lily Tomlin’s Edith Ann character delighted audiences by telling the truth — as she saw it. My grown up aunt — far right — was the hostess at this party. 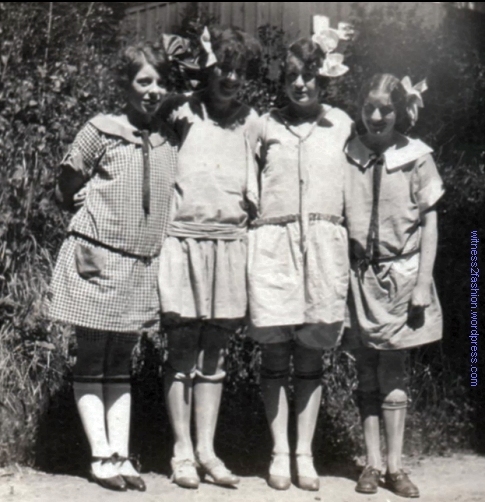 Vintage photo of women in little girl costumes. 1920s or 1930s. At least one of her guests came in a different costume! 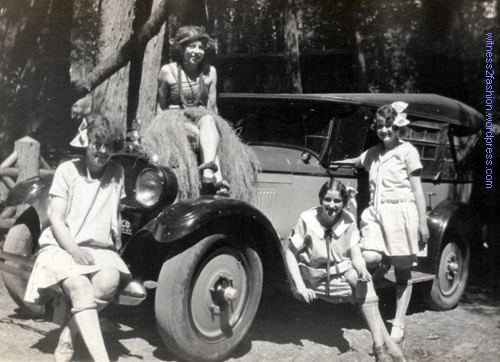 Guests at a costume party, 1920s or 1930s. One woman is dressed in a hula skirt. 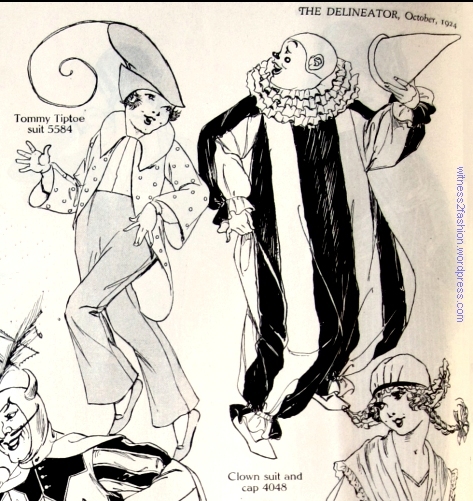 Butterick costume patterns for Tommy Tiptoe, No. 5584, and a clown, No. 4048. Delineator, Oct. 1924. Tommy Tiptoe was a children’s book by Harriet Ide Eager, published in 1924. This costume is based on the book’s cover illustration. Click here. Turkish costume, Butterick pattern 4832, and “Ballet Costume” No. 3555. Turkish costume (Butterick 4832) and Ballet Costume 3555. Delineator, October 1924. The Turkish harem pants have a low waist and 1920’s hip sash. A more modern Butterick costume pattern (coincidentally #3555) includes a harem pants outfit. Click here for comparison. 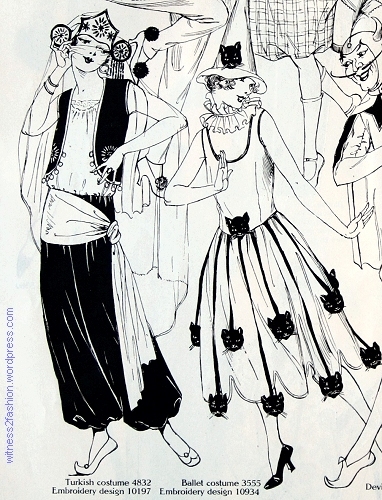 A ballet costume which includes a witch’s hat and cats’ heads as trim is certainly unusual! Butterick embroidery transfer 10934 can be seen here. Perhaps these heads are stuffed, rather than completely flat? This can also be made as a “Pierrette” costume. This devil costume was illustrated in September and again in October, 1924. Butterick pattern for a Devil Costume. 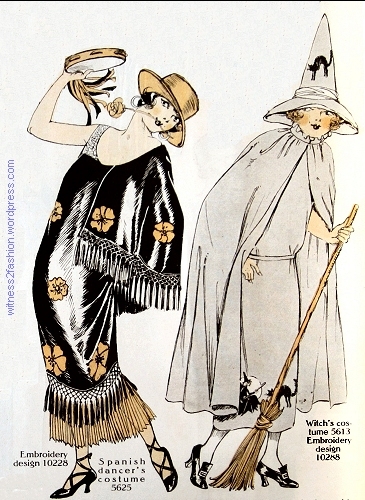 This illustration is from the September issue of Delineator, 1924. It looks like a stage costume — pseudo Elizabethan. 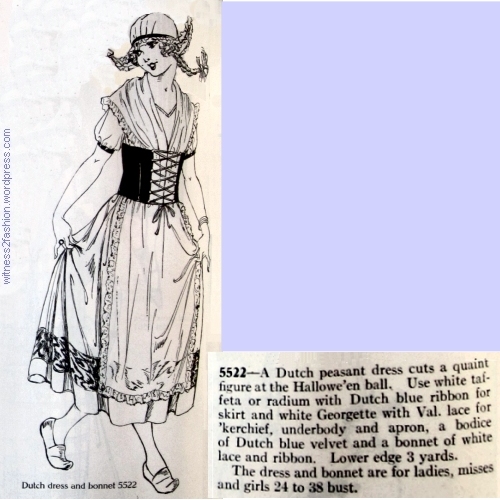 Dutch peasant dress for ladies, misses and girls, Butterick #5522, Delineator, Oct. 1924. Japanese kimono costume #3847 and artist’s smock with tam-o’-shanter, Butterick, # 43o8. Nov. 1924. The kimono costume’s number shows that it was released before the Halloween season — probably for amateur productions of The Mikado or Madam Butterfly. The artist’s costume — or at least the illustration of it — is absolutely my favorite. That’s not a cigarette holder in her mouth — it’s a paintbrush. 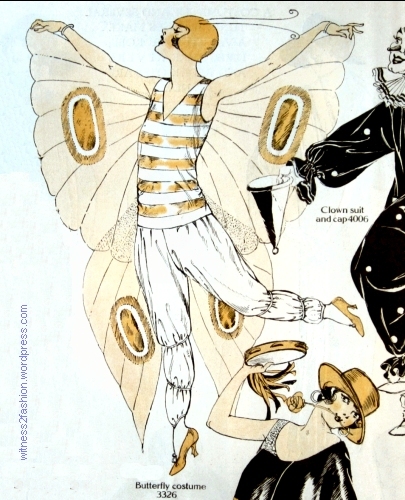 Butterfly costume, Butterick pattern 3326, Delineator, October 1924. Pineapple cloth was sheer, and originally made from pineapple fibers. Let’s hope she didn’t have to spend the entire evening holding her arms up like that! 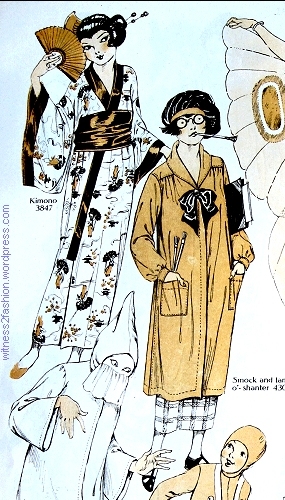 This identical Butterick pattern was still for sale in 1929. Click here. Clown costume, 1924. 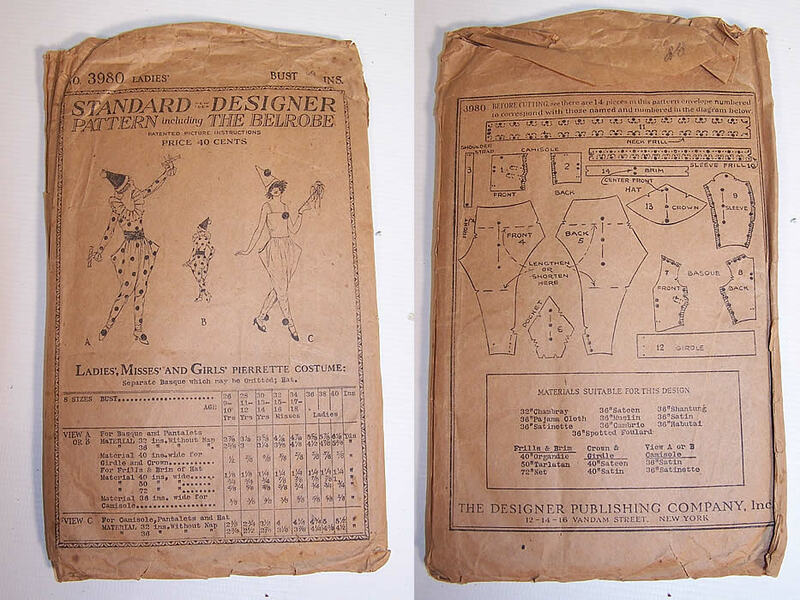 Butterick 4006, Delineator magazine, Oct. 1924. For men or boys. Tarlatan is a stiff, loose woven fabric. Heavily sized, it was used for petticoats and costume ruffs. Malines is “a fine stiff net with a hexagonal mesh.” “Silesia” was a twill fabric used for pockets and linings — and therefore, inexpensive. This unconvincing ghost (with unfortunate hints of the KKK in its pointy head) is quite different from the usual sheet-with-eyeholes ghost. (How disappointing to think that high heels will be required after death….) She is accompanied by a Brownie: the kind of elf that comes and does good children’s work while they’re asleep (If only…!) and a little ballet dancer. A Ghost (5914), a Brownie (5369), and a little ballerina (3555) costume. 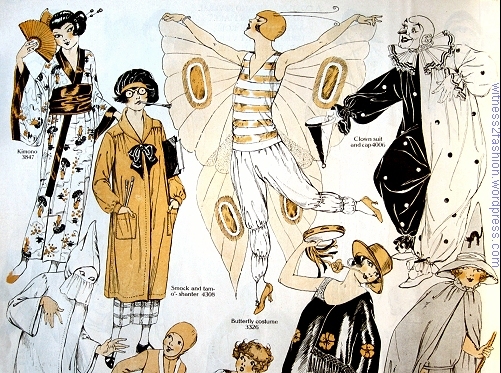 Butterick patterns for October, 1924. The freedictionary.com says that “paper muslin” is “glazed muslin, used for linings, etc.” Whew! That’s a relief. No Paper Costumes, ever! Please! 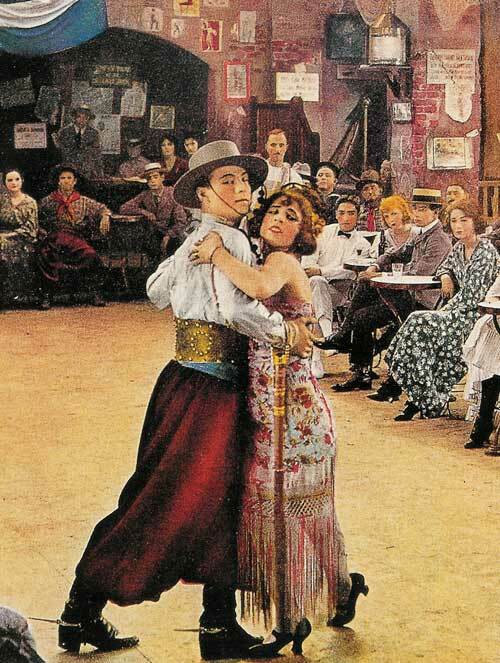 Costumes for a Spanish Dancer (Butterick 5625) and a Witch (5613.) Delineator, Oct. 1924. Woman draped in a Spanish Shawl; ad for Standard Plumbing Fixtures, Delineator, Oct. 1924. The seated woman has a black mask — a domino — in her hand. 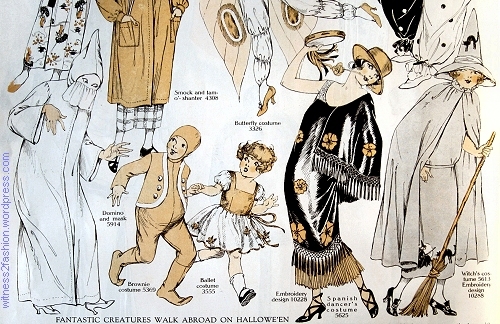 In 1924, as in 2015, movies and popular entertainment influenced our Halloween costumes.